An old friend of mine happened to e in Melbourne, Australia just as my book was published and managed to capture a photo of it in the wilds of a bookshop. Always fantastic to see your book out in the world, and oh my goodness, the company it’s keeping! I’m delighted to say that The Last Wave will be available from Text Publishing in Australia and New Zealand from 8 January 2019. I’m also incredibly jealous that my book will be enjoying the beautiful summer weather, while I struggle through the rain and gloom in the UK. I'm really thrilled to say that Text Publishing (Melbourne) have bought the Australian, New Zealand, and UK rights to The Last Wave! At the beginning of May, I went to visit a dear old friend in Cayman. 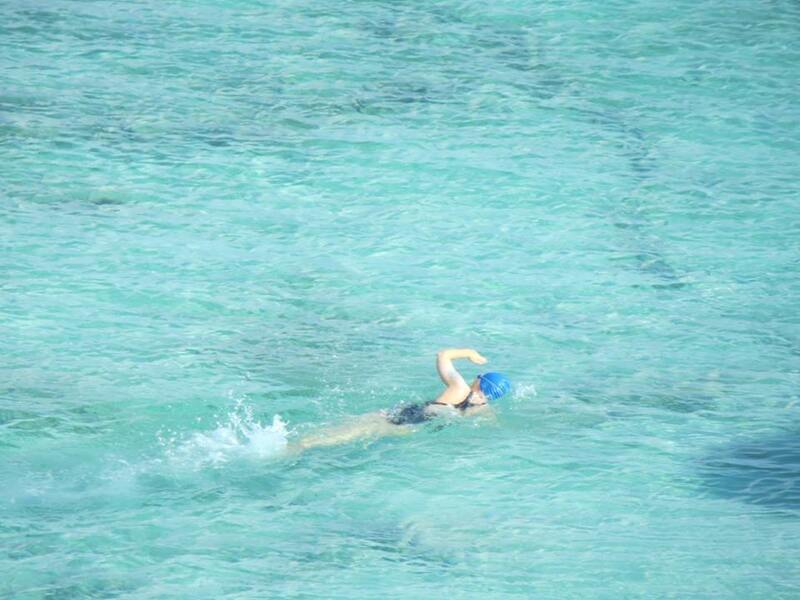 And I swum in the kind of sea I thought only existed in travel brochures. It was lovely to be out of the pool. Martha would approve, surely. I am thrilled to say that German publisher Droemer will be publishing The Last Wave in 2019! "The novel is beautifully poignant. Its emotional undercurrents are presented in a quietly powerful style, free of manufactured melodrama. Details are carefully chosen and breathe life into depictions of Dover and France. Martha’s myrtle bush, a plant usually found near the sea, is a lovely recurring symbol of the connections, however loose, that hold her family together. It takes on human form in Harriet’s daughter, Myrtle, an eager young swimmer who establishes a link between Harriet’s wife, Iris, and Martha." At the Winter Institute, in Memphis, TN, I had the pleasure of meeting a lot of really cool, really interesting indie booksellers. Last weekend, I caught up with one of them: Ben Rybeck, of Brazos Bookstore (and himself an author), and had a nice chat about zombies, TV adverts, and The Last Wave. First, let me back up here and confess something: I write this article for BrazosBookstore.com with absolutely zero pretense toward anything resembling journalistic objectivity. I met Best in January, at the American Booksellers Association’s Winter Institute in Memphis, Tennessee—imagine summer camp, but for booksellers in the winter and with a lot more drinking—when I had dinner with her and her publisher, House of Anansi Press, a venerable Canadian publishing house with a connection to pretty much every major author from that country you can think of (including, yes, giants like Margaret Atwood and Michael Ondaatje). Press coverage of the option deal announced 20 March 2018. The Bookseller "The novel by Bristol-based Best was published in North America by Canadian publisher by House of Anansi Press and has become a book club favourite, according to an Awesome spokesperson, “establishing its author as a bold new voice in literary fiction”. The deal marks Awesome’s first literary acquisition since taking investment from global content company Kew Media Group in October last year. With Kew’s backing, Awesome is “ramping up its scripted development of book-based IP” according to a spokesperson." Deadline.com "Awesome Media & Entertainment, the production company set up by author Jeff Norton, is developing novel The Last Wave into a television series." The Fan Carpet "Jeff Norton’s London-based company to develop book for television. Written by award-winning, Bristol-based Gillian Best and published by House of Anansi Press, ‘THE LAST WAVE’ won rave reviews in North America and has become a book club favourite, establishing its author as a bold new voice in literary fiction. In truly exciting news, I'm thrilled to say that Awesome Media have optioned The Last Wave. Awesome will immediately begin developing the book for television, with Jeff Norton and ex BBC Worldwide and ITV Studios executive Fraser Robinson attached as Executive Producers.